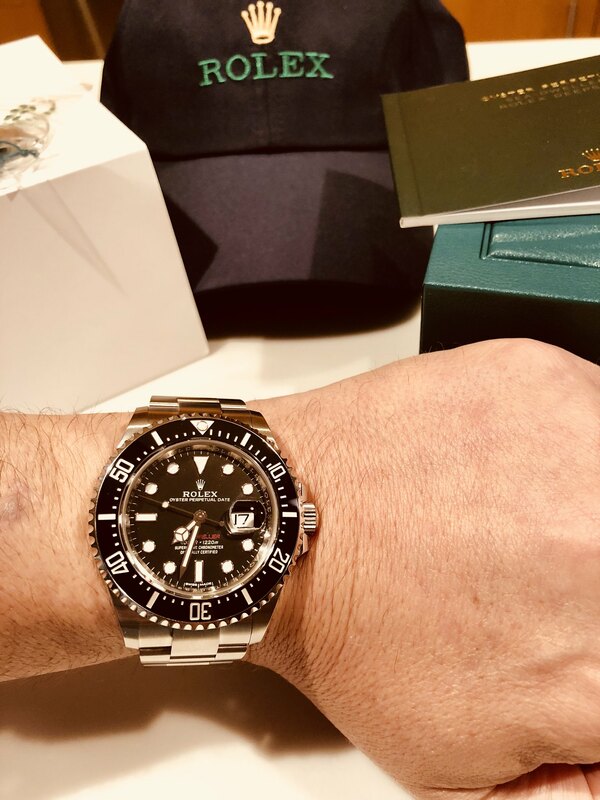 My last Rolex purchase was the BLNR a few years ago and I have been itching for something new. While the new Pepsi GMT is at the top of my list I had my AD also put me on the SD43 list as well. I got the call late last week and went to try it on. While I was on the fence having a vintage E series 16610 sub I was really impressed with the size, build and details of this watch. Despite the larger size case and band the watch wears surprisingly flat and does not feel oversized on my somewhat smaller wrist. Love the red text, new movement, case/band proportion, etc. Meanwhile I've put the sub on a NATO giving it a much different look. Props to my AD for including the nice hat too! I'm totally loving my SD43. Imho, it's unique and substantially different (in look, proportions, and fit), from any other Sub or SD I own. In fact it's actually more comfortable on the wrist than other smaller, lighter watches in my collection. Go figure, lol. Hope your new SD43 brings you much enjoyment. Mine says hello.. Thanks Rick - looking good BTW. You've got a wrist that can really handle that baby. I was on the fence with my smaller (6.75"+) wrist but I thought the fit was great and that it wears flat and smaller than say the Sky Dweller. Couldn't agree more about the comfort. Thanks again and enjoy your's as well. That's a beautiful watch. If I were to look to buy another Rolex right now, it would be between the new SD43 and Pepsi GMT. Both of those are going to be hot and hard to come by for a while. Congrats on the pickup! Question about the bracelet on the SD43. Is it the same size and width as the SD4k (116600)? Overall it appears to be a remarkable Seadweller, quite compelling. ..compared to the one on the SD4K to better match the larger case size of the SD43. The two updated 2018 Deep Seas (with new 3235 calibre movement) have also received the new wider bracelet. -Rick. I presume they're well received. I like the bracelet on the 116610 as-is but would imagine the 126600 and of course Deepsea would benefit from a wider / more robust bracelet. The SD43 is the most worn watch I currently own, and putting aside sentimental attachment, it is possibly my all time favourite watch from a pure watch standpoint. It is a fantastic piece....so cohesive, much more than I think most people first gave it credit for. I did just get the new pepsi GMT, and it may be the new kid on the block, but the SD43 is still, for me, perfect. I've said it many times, if people have a chance, I think it's worth checking out and picking up. Wear it in the best of health! congrats, enjoy with good health. I got one last November from my AD with the intention of flipping it for profit. I was happy with how my 16610 feels on my wrist; I thought 43mm would be too large and heavy for me. Previous Topic: Brooks Koepka takes the US Open for the second year in a row. Next Topic: New Rolex GMT II Pepsi or Vintage. Which would you buy?